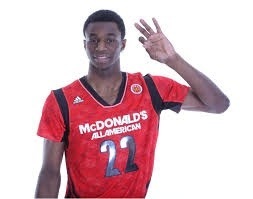 Wiggins entered the 2013 recruiting class picture when it was found out that he was eligible. He was originally expected to be a heavily talented recruit in the 2014 class. He took the attention away from stud forward Jabari Parker. At first, Parker was projected to be a recruit that comes once in a lifetime, however Wiggins entered the picture and thus the national spotlight for Parker dissappeared. It is unbelievable how forgotten Parker is. It is well deserved though, Andrew Wiggins is an amazing player. He is considered to be the top prospect since LeBron James. Many people compare his talents to LeBron, but I don’t think he is quite there yet. Adidas has reportedly mulled offering Andrew Wiggins a 180 million dollar contract with Adidas, which is nearly half of LeBron James’ Nike deal. This would be a bold move because it would put Adidas back in the same light as Nike. Adidas would then have two excellent talents in Andrew Wiggins and Derrick Rose to endorse their product. Wiggins would be ludacris to turn down an offer like this to not only get that Adidas contract, but to be selected 1st overall in the 2014 NBA Draft. 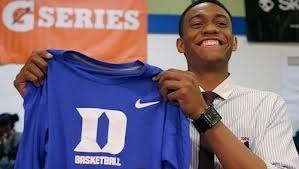 With Wiggins entering the picture, highly touted Duke forward Jabari Parker has taken a seat away from the national spotlight. 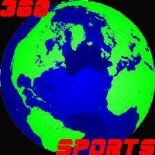 If Wiggins has the year that everyone excepts, he will likely be selected 1st leaving Jabari Parker to be selected 2nd. Jabari might as well spend his time by receiving a good education at Duke and then be selected 1st overall in the next NBA draft. Jabari is known as a scholar who had a 4.0 GPA in High School. He is a genius and he considered Duke partly because of its educational prestige. Jabari will play on a good team this year, but could play on an even better team next year if Duke lands the two top prospects Jahlil Okafor and Tyus Jones. He would have the potential to win a National Championship if not two. Jabari also has been publicly impacted by his father’s comments, which could lead him to stay with Duke because he wants his son to get a good education as well. Gary Harris had a superb freshman year and showed that he could easily be an NBA player, but he decided to stay in college for another year of college ball. Harris is a great shooter who has great court vision as well. Gary Harris should have went pro and probably would have had major success as a young guard and would have went in the top 10. MSU players typically stay with the team because they are so convinced that coach Tom Izzo can bring a championship anytime the team plays. Harris is a team player, but could also excel in the role of volume scorer, which is what will happen this season. Harris will stay for his Junior Season and eventually be drafted inside the top 10. Russ Smith could have easily gone pro after this season, but he decided that he could enter the draft in a few years after he can showcase himself as a true talent and not in a complementing role to Peyton Siva. Russ Smith provides an explosive scoring ability, which shows that he can be at least a volume scorer off the bench like J.R. Smith. Russ showed his talent last season when it counted during March Madness. He was expected to go pro this years, in fact multiple sources stated that he would enter the draft. One issue for Smith is that he is a shooting guard that is not quite tall enough to be a shooting guard in the NBA. Height is decently important to be a shooting guard. Joe johnson and Vince Carter are two examples of big shooting guards. They typically use their size to take advantage of their position. One short shooting guard in the NBA is Jason Terry. Terry uses his shooting ability and his pull up three point shot to score points. Smith is more of a slashing shooting guard, but if a tall guard like Johnson is in the pain then it is going to be hard to go to the basket. He will likely go pro however because he is too talented for college basketball. Julius Randle is the third best recruit in this years’ recruiting class. 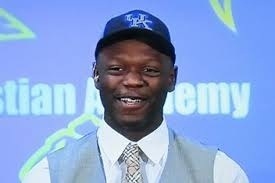 As expected, Julius Randle joins another talented recruiting class for Coach Calipari and the Kentucky Wildcats. He will likely be the star of this team. Randle has shown that he is talented in the McDonald’s All American Game and the Jordan Brand Classic. Julius Randle is considered by some as the second best prospect ahead of Duke’s Jabari Parker. Randle is a power forward who can score with ease. He has a nice athletic ability for a great game in transition. He will run the floor as well as anyone. Coach Calipari’s prospects tend to leave after one year like John Wall, Demarcus Cousins, and Nerlens Noel. I realize that the players leave because even brighter prospects come in the next year and that their draft stocks could lower with less playing time. Randle will leave after Kentucky records another good recruiting class. Marcus Smart would have been a top 5 pick had he entered the NBA Draft. He was the top point guard by far and would have been a shoe in prediction for rookie of the year. 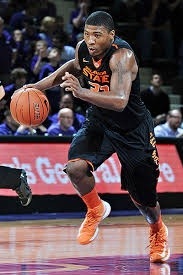 Smart was a supreme talent for the Oklahoma State Cowboys last season. He stayed with the team so that he could play another year with this talented team. He felt as if this team could have won a championship, so he decided to stay. Next year, Smart will be a top 5 pick once again and unlike Mark Ingram in football, Smart will make the smart move and enter the draft while his stock is on the rise. This entry was posted on October 22, 2013 by Dylan Bernstein in NBA, NCAAB, Uncategorized and tagged Andrew Wiggins, AP top 25, college, College Basketball, Duke, final four, Gary Harris, Jabari Parker, Kansas, Kentucky, Kevin Ware, Louisville, Michigan, Michigan State, NBA Draft 2013, NBA Draft 2014, NBA Draft 2015, NCAA, NCAA Championship, Nerlens Noel, One and Done, Prospects, Recruits, Russ Smith, Title Game, University.